As soon as Mike Hutchens laces his skates and steps out onto the ice, he listens carefully to the noises around him. Over the sounds of coaches shouting drills and volunteers pounding their sticks onto the ice to help guide fellow players—Hutchens is focused on the clanking of a loud, metal puck gliding toward him. Though he’s without his sight, the 33-year-old Mankato, Minn., native relies heavily on the echo of his voice and the sounds on the ice to serve as his guide. Hockey is still new to Hutchens. But as one of 18 registered players in Minnesota’s first-ever blind hockey program, the sport is quickly becoming one of his favorite pastimes. The Minnesota Wild Blind Hockey program, presented by UBS Financial Services, was launched as a partnership between Minnesota Hockey and the Minnesota Wild. The first practice was held in October 2018. Like Hutchens, skaters of all ages, skill levels and visual impairments participate in weekly ice sessions, while learning the basics of skating and hockey. Few adaptations are made to the game, but the biggest difference is the puck. It’s large, the size of a dinner plate and slower than a traditional hockey puck. Toni Gillen, disabled programs director for USA Hockey in Minnesota, can’t help but smile as she stands inside the loud rink. Players are getting their chance to live a dream, thanks to countless individuals who made the program possible. 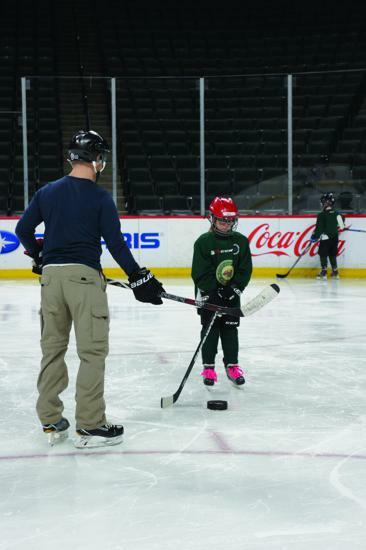 Though still in its infancy, the Minnesota Wild Blind Hockey program is thriving. Blind hockey is still relatively new to the United States. Its origins can be traced to Canada in the early 1970s, but the sport wasn’t officially introduced into the U.S. until 2014. During the first-ever Blind Hockey Summit held in Newburgh, N.Y., in October 2014, local players and visiting Canadian players played games and held try-it sessions for anyone who was interested. The response prompted USA Hockey to hold a similar event at the 2015 USA Hockey Disabled Hockey Festival in Buffalo, N.Y., and blind hockey has since become one of the fastest growing segments of Disabled Hockey. Gillen has been a disabled programs director for USA Hockey in Minnesota for nearly 12 years, and has organized warrior hockey programs for veterans injured in combat, special hockey programs and sled hockey programs. The reaction to the blind hockey program was greater than she could have ever expected. Some of Gillen’s first contacts were with the Minnesota State Services for the Blind in Mankato. They were able to send information out via radio and correspond through their network to assist in finding coaches. The response led Gillen to Lonny Evans. In addition to coaching with two other coaches and helping to organize players and volunteers at practices, Evans volunteers his time as a program director, which involves connecting with many families and communities. For Evans, the chance to help pioneer a sport for disabled athletes is close to home. In his experience helping with Minnesota Wild Blind Hockey, Evans knows there’s still work to be done. But the success of the program so far has been phenomenal. Minnesota Wild Blind Hockey welcomes all players with open arms. From its youngest 9-year-old skater to its oldest who is in his 50s, the program is all-inclusive. Whatever their level of experience, players participate in the sport with minimal adaptations to the traditional game. Nets are 3 feet high instead of 4 feet high, and the puck is much larger and louder. Teams are also required to complete one pass in the attacking zone prior to being able to score. To help indicate when the attacking team is eligible to score, officials use a different whistle. Players also play in different positions, depending on their visual acuity. The more a player can see, the further up they play. All skaters have some level of visual impairment, but goalies are typically completely blind. If they’re not, they’re blindfolded. Since its inception, Minnesota Wild Blind Hockey has witnessed unwavering support. The program typically welcomes a hockey team—from Squirts to Peewees to Bantams —or a group of volunteers to assist the team during practice. Whether it’s guiding them across the ice, passing the puck or lending a few words of encouragement, volunteers are available to provide supplementary support to the players. A Minnetonka Peewee hockey team volunteered its time when the Minnesota Wild Blind Hockey Team practiced at the Xcel Energy Center in mid-December. For two skaters, it was a chance to connect on a new plane. Ever since Gillen approached Minnesota Hockey and the Minnesota Wild about blind hockey, both have show full support. The Minnesota Hockey and Minnesota Wild logos have also provided validating support for the entire hockey community. For players like Hutchens, who have been hockey fans for years, getting involved in a program like Minnesota Blind Hockey is especially enjoyable. Hutchens has been a Minnesota Wild hockey fan since 2000, which made the opportunity to practice on the same ice as his favorite players a surreal experience. The support is just another example of Minnesota’s tight-knit hockey community. During the weekend of August 23-25, 2019, the Minnesota Wild, Minnesota Wild Foundation, Minnesota Hockey and USA Hockey will host the 6th Annual USA Hockey Blind Hockey Summit at TRIA Rink in downtown St. Paul. The event will feature a coaching clinic, a try-it session, a community banquet and games for all sizes and skill levels. The location will also soon be a familiar place for the Minnesota Wild Blind Hockey team. During the program’s inaugural season, weekly practices were held in various locations throughout the Twin Cities metro area, including rinks in St. Paul, Blaine and Woodbury. But starting with the 2019-20 season, the team’s home rink will be TRIA Rink. Gillen also hopes to welcome new faces to the team in the comings years. She’s optimistic the program will garner enough players for both a youth team and an adult team. If the first season is any indicator if its success, both Gillen and Evans know there’s much potential for the future of the program. Minnesota Wild Blind Hockey has opened new doors for novices, and has made dreams come true for players who used to spend so much of their time on the ice.